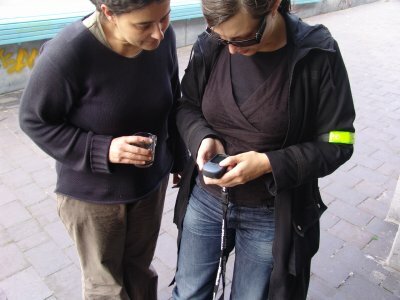 The aim of this day was to collect GPS tracks of Brussels and to add them to the database of openstreetmap.org., an interface that produces detailed maps that can be freely published, used to create portable navigation systems, carted away or printed and copied without any restrictions. The participants covered therefore the streets of the Pentagon in order to record these GPS tracks and helped to download them on the OSM server. from using them in creative, productive or unexpected ways." a photo device or dictaphone. info about the type of route or path and connections. embedded, printed navigation systems which can be copied without limits.